A 38 North exclusive with analysis by Joseph S. Bermudez Jr., Curtis Melvin and Frank Pabian. The July 28 test launch of North Korea’s Hwasong-14 (KN-20) has raised concerns both over North Korea’s progress in developing an operational intercontinental ballistic missile (ICBM) capability, but also about the nature of the facility itself and why the North conducted the test launch from this location. Contrary to published reports, the test launch was conducted from the No. 65 Factory, not the Yongnim Missile Base or any kind of missile operating base. It is also not one of the Strategic Force’s missile operating bases or missile storage facilities. This site is under the Second Economic Committee and is associated with the Strategic Force, as it was used to modify trucks into transporter-erector-launchers (TELs). It was likely chosen to demonstrate the DPRK’s ability to launch ballistic missiles from varied locations in the country, not just those associated with Strategic Force infrastructure, to enhance both security and survivability in case of attack—another sign of the difficulty the United States would have in conducting effective military strikes against North Korean missile sites. The No. 65 Factory is one of North Korea’s oldest and largest weapons manufacturing facilities, having started production during World War II under the Japanese. During the Korean War, the facility was moved north into Chagang (Jagang) Province as United Nations Command forces moved north. Since that time, the facility was moved to its current location (40 km southwest of Kanggye, near the town of Mupyong-ni), and expanded, now employing an estimated 10,000 workers. Its importance to the North Korean regime has been repeatedly demonstrated by the numerous visits by Kim Il Sung, Kim Jong Il, Kim Jong Un and senior officials from the Korean People’s Army and Workers’ Party of Korea. During the mid-1980s, the No. 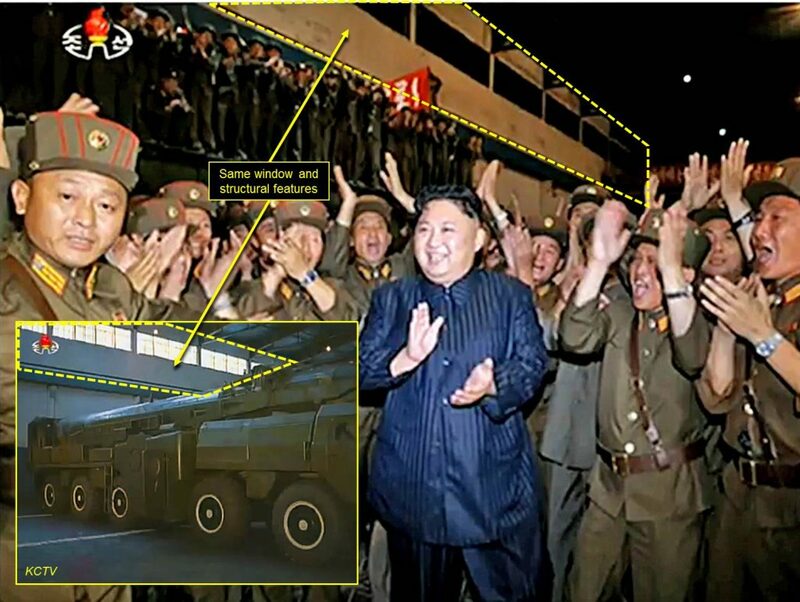 65 Factory likely became involved in the ballistic missile program when North Korea undertook the conversion of imported Japanese heavy-duty logging trucks into scud mobile-erector-launchers (MELs), missile transporters, missile cranes and other specialized vehicles. It was also during this period that North Korea acquired and refurbished a number of MAZ-543 transporter-erector-launchers (TELs) for the scuds then entering service. During the late 1980s and early 1990s other imported trucks were converted into additional MELs, TELs and support vehicles. In 2011, North Korea’s Forestry Ministry imported “six units of the off-road trucks (WS51200) … from Wuhan Sanjiang Import and Export Company, Limited (China).” The No. 65 Factory then converted these to serve as launchers for the Hwasong-10, -13 and -14. 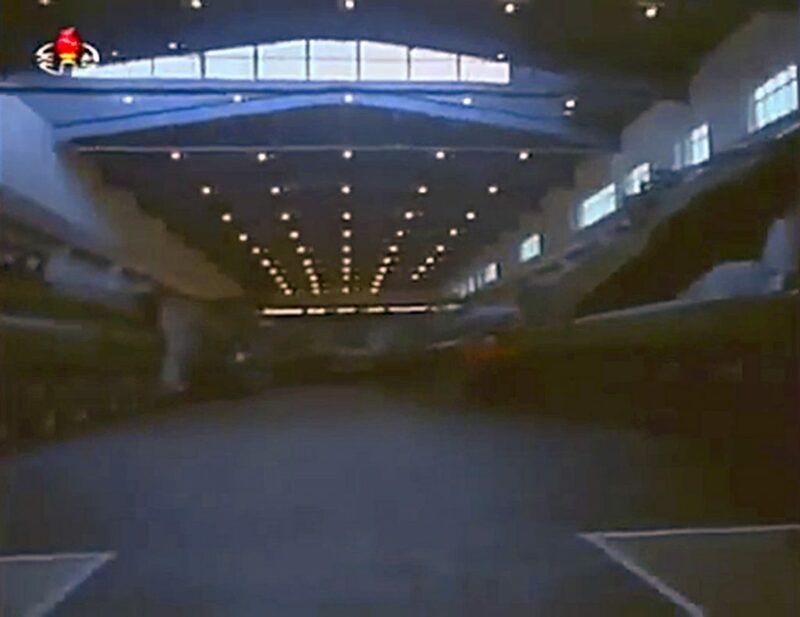 The two halls in which this work took place had to have their roofs modified by the addition of a raised copula to allow the TELs to fully elevate a missile. More recently, it is likely that the factory has also worked on the MEL for the new canister-based ballistic missile displayed during the April 2017 Pyongyang military parade. 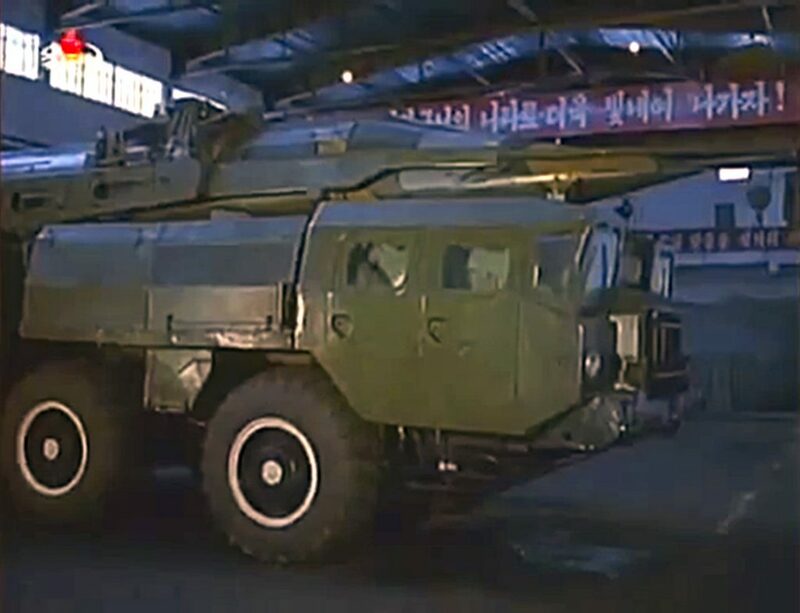 This MEL’s cab is reportedly based upon a Russian vehicle assembled within North Korea as the Taebaeksan-96. Kim Jong Un accompanied his father, Kim Jong Il, on a visit to No. 65 factory in 2011; video of this visit was released in 2013 that showed the interior of one of the conversion halls. Figure 1. A Nodong TEL inside one of the TEL Conversion Halls at the No. 65 Factory, 2013. Figure 2. 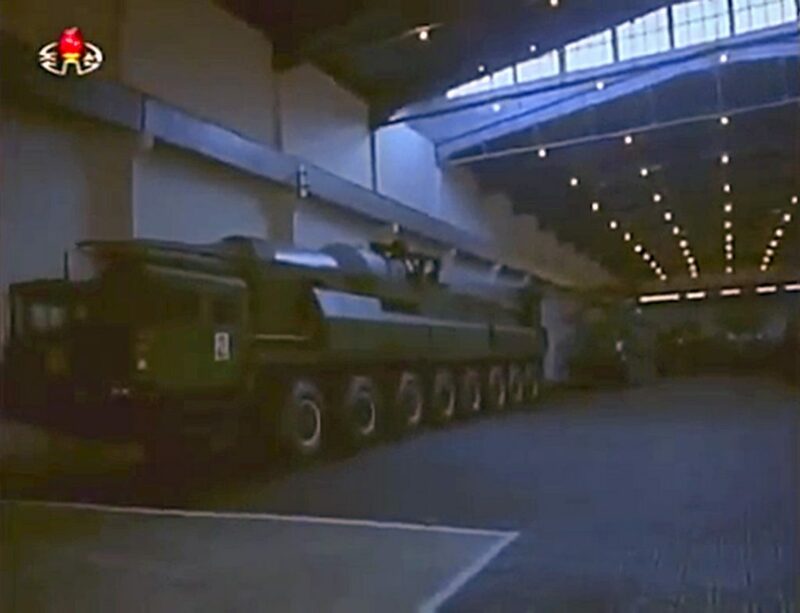 An early Hwasong-13 on a WS51200-based TEL inside one of the TEL Conversion Halls at the No. 65 Factory. Note the elevated cupola in the roof of the hall, 2013. Figure 3. Looking down the center of a TEL Conversion Halls at the No. 65 Factory. Early Hwasong-13s on TELs can be seen on either side if the hall and the elevated roof of the cupola is clearly visible, 2013. Located on the west side of the Changja River (i.e., the Changja-gang), immediately west and northwest of the city of Chonchon (40.611369, 126.467036), the No. 65 Factory occupies approximately 12.5 km2, encompasses seven named towns and is dominated and segmented by a mountain that is approximately 680 m high. While a number of administrative and support buildings, warehouses and erection halls are located in the valleys around the mountain, there is a massive underground facility (UGF) underneath the mountain in which the main production facilities are located. This UGF was constructed to protect the valuable production lines from damage in a future war. 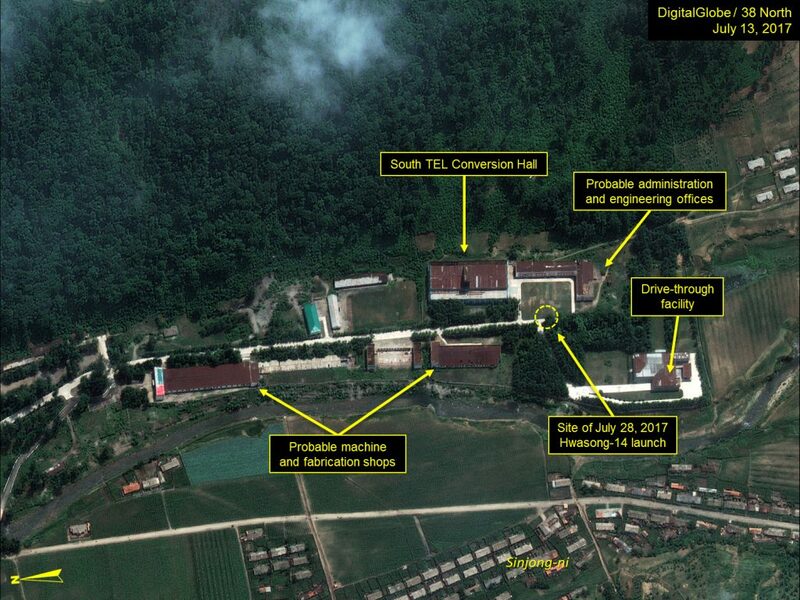 Dave Schmerler and Aldin Abazovic were among the first to publicly identify the July 28 Hwasong-14 launch site; they both placed it on the west side of the UGF near the village of Sinjong-ni and adjacent to what is commonly known as the South TEL Conversion Hall—one of two known locations within the No. 65 Factory associated with TEL conversion/modification. Figure 4. The No. 65 Factory grounds, site of the July 28 Hwasong-14 Launch. In mid-July, a small concrete pad was poured approximately 65 m southwest of the South TEL Conversion Hall. It was from here that the Hwasong-14 was positioned for the July 28 launch. If the Strategic Force followed previously observed pre-test launch procedures, it is likely the Hwasong-14 TEL and missile were moved to the No. 65 Factory several days before the test from a nearby operational missile base; both were serviced and checked-out here prior to the launch. Figure 5. Close-up of the concrete launch pad. For the launch, a temporary observation position was setup in front of a support building at Chu-dong, approximately 1,300 m north of the launch site. 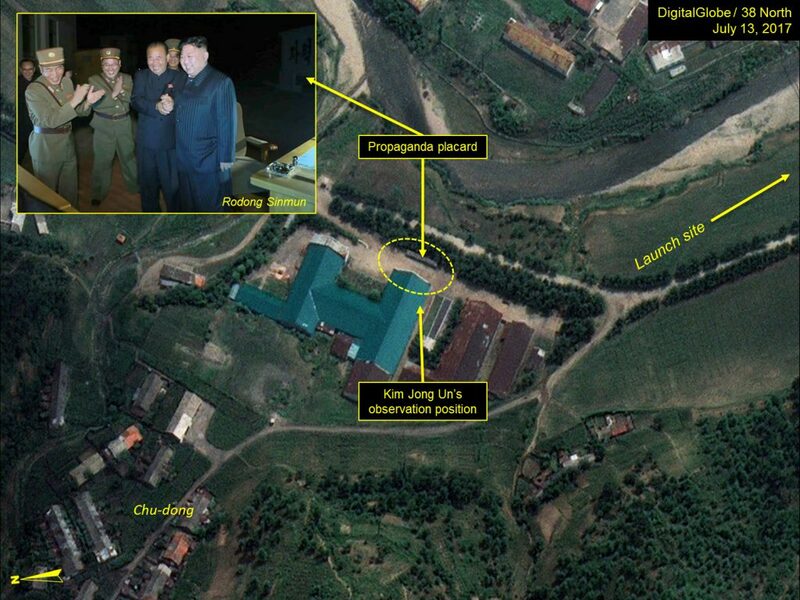 It was from here that Kim Jong Un observed the launch. Following the launch, the participants assembled in what appears to be one of the TEL Conversion Halls to be congratulated by Kim Jong Un. Figure 6. 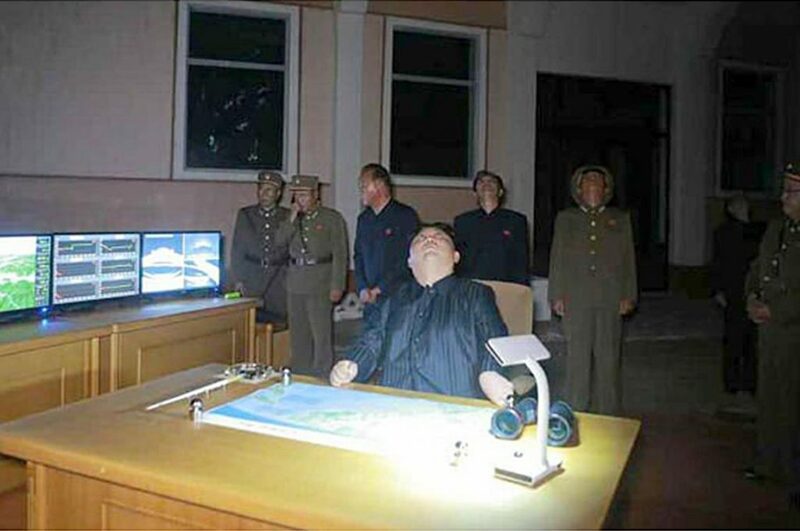 Kim Jong Un’s observation position. Figure 7. Kim Jong Un watching the test launch of the Hwasong-14 from the observation position 1,300 meters north of the launch site. Figure 8. Kim Jong Un in another view congratulating participants in the July 28, 2017 Hwasong-14 test launch. This image was likely taken inside one of the TEL Conversion Halls at the No. 65 Factory (Photo: Rodong Sinmun) with interior structural features that match well with the TEL Conversion Hall (inset) visited by Kim Jong Il (Inset photo: KCTV). 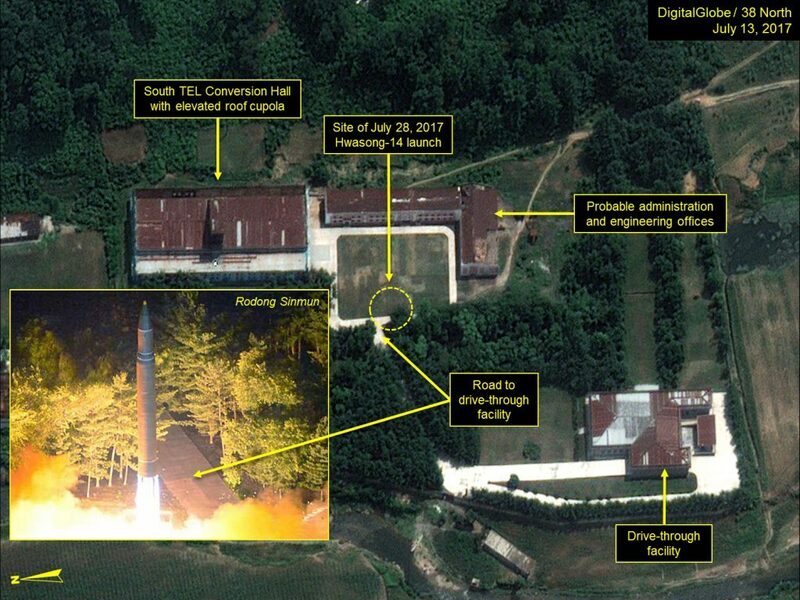 If North Korea follows the pattern it has established during the past year of moving launch locations, it is unlikely that they will reuse the No. 65 Factory test site in the near future. From an operational standpoint, the North’s Strategic Force would not use the No. 65 Factory launch site during wartime operations as the facility is well known and undoubtedly would be a target of air and missile attacks. Ballistic missile units instead would operate in remote areas from the North’s widely dispersed network of missile operating bases using pre-surveyed, but unimproved, launch positions and “shoot-and-scoot” tactics in an attempt to increase survivability. While the Strategic Force undoubtedly has a long way to go to develop wartime operational capabilities, those it has demonstrated and practiced to date would complicate any operations to eliminate its ability to launch ballistic missiles in either a future war or during a military response to some future provocation. The No. 65 Factory is the facility’s internal designation, while its national cover designation is the February 8 Machine Complex. Over the years both have been known by various English translations: No. 65 Arms Plant, No. 65 Machinery Factory, Chonchon Factory/Plant No. 65, Chonchon No. 28 Machine Factory, February 8 General Machine Plant, February 8 Machinery Complex, 8 February Machinery Plant, 2.8 Machine/Machinery Plant/Complex or Chonchon 2.8 Machine Factory. In the past, the US intelligence community used to designation Mupyongni Arms Plant or Munitions Plant. There are also reports of both the Chonchon Rock-Drill Plant and Hangmu Machine Technology School which appear to be located within the No. 65 Plant. “Japanese Big-Truck Sales to North Korea Suspended,” Wall Street Journal, June 17, 1987, p. 1; and “Nissan Diesel Trucks Used as Missile Launchers in North Korea,” Jiji Press, May 22, 2001. The launcher for the Hwasong-10, -13 and -14 can operate as either a TEL with the vehicle remaining attached to the launch table when the missile is fired, or a transported-erector (TE) with the vehicle setting the missile on the launch table and then moving off. “Kim Jong Ils Efforts to Defend the Country,” KCTV, released August 24, 2013, accessed October 12, 2016, https://www.youtube.com/watch?v=bQKFC7pK3wc. This video is no longer available at the cited link. “Kim Jong Un Guides Second Test-fire of ICBM Hwasong-14,” Rodong Sinmun, July 29, 2017.